So, does this “local” model conform exactly in every detail with Smith’s narrative? Of course not because his narrative is a fictitious blend of the real and the imaginary. But the local model does provide a basic structure upon which Smith’s miraculous fantasy tale can be built. This may sound kind of smart, but the reality is what he is doing is making his theory totally unfalsifiable. If a model cannot be scrutinized against the Book of Mormon text itself—and stand and fail based on how well it conforms to it in detail—then there is really no way to criticize it. Anything that corresponds to it, in even the vaguest of ways, is seen as a hit, while anything that does not match is just blown off as Smith’s “imaginary” stuff. If he wants to go on believing this stuff, fine. I take things on faith, too, and there are some arguments I would make that are also unfalsifiable. My purpose in doing so, however, is to point out that it is through faith, not science, that we can come to know the truth of the Book of Mormon. (Though I do not believe science, history, and archaeology have nothing to tell us about the book, either—something that should be obvious to readers of this blog.) He, on the other hand, seems to want to pass his untestable, and thus unscientific, little theory as more reasonable than to believe the text is genuine. But since it is untestable, there is no way to determine that, now is there? John Sorenson’s model is meticulously detailed, methodically researched, and very much testable. Hence, his is vastly more scientific than Brent’s little armchair ruminations. Book of Mormon geography? Look no farther than Smith’s own backyard. The region where he lived is replete with lakes, streams, and rivers as described in the Book of Mormon. Here is a perfect case in point: This is so vague as to describe almost any patch of land on the planet, save massive deserts, such as the Mohave or Sahara. (Perhaps I should say any inhabitable patch of land?) While that is an exaggeration, it is not by much. This tells us nothing. Additionally, the landscape in this region is covered with ancient and mysterious mounds and burial sites (possibly remnants of the Hopewell culture) indicating to the people living there in the early 19th century that, according to Ethan Smith (and many others) in his book View of the Hebrews, millions of inhabitants must have once dwelt there. No need for the Nephites and Lamanites (and Jaredites) to migrate thousands of miles from Central America to western New York for the final battle scenes and eventual deposition of the gold plates in the nearby Hill Cumorah/Ramah. I’m not going to go into the Ethan Smith/View of the Hebrews stuff. That is an entirely different discussion. But this tells us pretty much nothing about BoM geography, except that his final comment—about the final battle scenes—suggests to me that he is not really all that well read on BoM geography. Virtually no one (and certainly not anybody taken seriously) is suggesting that BoM peoples traveled thousands of miles to the NY hill. The narrow neck of land as described in various parts of the Book of Mormon conforms nicely with the Michigan Peninsula (although an adjacent narrow neck of land is also a good candidate), with an East Sea (Lake Huron, [throw in Lake Erie also if you'd like]) and a West Sea (Lake Michigan). Also, this would suggest that his “local” model is largely west of where Joseph Smith actually lived. It is questionable, however, how familiar Joseph would have been with these western territories at the time the BoM text was being dictated. This really isn’t a very “local” model at all. Since there is no description of the natural flora in the Book of Mormon, the region’s own trees and plants will do the job. And, of course, there are ample supplies of cattle, horse, swine herds and flocks as well as cultivated barley and other grains there. (But of course the Europeans brought them all). Again, too generic to be of any value. Just about any “flora” could “do the job” with that kind of thinking. One is left wonder, however, if Joseph Smith is just creating some imaginary story based on his own environment and experience, where is the snow and bitter freezing winters of New York and New England in his tales? Particularly on New Year’s day, when the BoM has people suffering from heat exhaustion. That does not sound like the New Year’s day a 19th-century Yankee would be familiar with. The region is expansive enough for all of the imaginary excursions, get-aways, migrations, and battle scenes described in the Book of Mormon. Thus it makes perfect sense to designate this region as the setting for the Book of Mormon; many problems are resolved in doing so. Again, so generic I could say this about pretty much anywhere, aside from the resolving problems bit. But just what problems are resolved? And what about the problems it creates, that are just swept under the rug with his convenient little, “fictitious blend” bit? He says that we need not look further than Joseph’s backyard for Book of Mormon geography, and even that it makes “perfect sense” to designate it as such. My question is, why are starting there in the first place, particularly since, as he admits, it does not fit exactly in every detail? Shouldn’t we see if there is a place that does fit exactly in every detail, or at least better in the details than Joseph’s backyard? What reason is there to prefer such an inexact match? The only reason to start there is if you start with the assumption that Joseph Smith made it all up. Then, so long you remain both vague enough and creative enough, he is right, you’ll never have to leave. But that does not mean you have found the right spot, or demonstrated that Joseph Smith made it all up. It just means you are very good at confirming your own a priori assumptions (a tendency known as confirmation bias). I am working on several projects right now. One of them is a comparative study of some 2 dozen BoM geography models and the methods employed to construct them. I’ll perhaps add more to the list before I am done. There is no question that, methodologically speaking, Sorenson is the most rigorous, and hence it is no surprise to find that his model also proves to be the best fit to both the text and the real world with the fewest anomalies. It certainly fits better than Joseph Smith’s backyard. The most important thing Sorenson got right is that you do not start in Joseph’s backyard, or even in Mesoamerica. You start in the Book of Mormon. You find out everything the book says about its geography and then you see if there is a place that fits the description. If no such place exists, then we have good reason to dismiss it as a real historical text, and this “fictitious blend” hypothesis might start to look appealing. But if there is a place that fits (and I believe that Sorenson’s Mesoamerican model, with a few adjustments, does indeed fit very well), then we have to seriously ask ourselves if it is reasonable to think that a “fictitious blend” of hundreds of details could really (a) produce a consistent enough picture to map out in the first place, and then (b) if it could, by chance, match a real world location with a high degree of accuracy. I don’t think either of those are likely should the BoM be false, but maybe that’s just me. What I find most interesting about Book of Mormon geography is that almost all of the descriptions of it are given BEFORE the great destruction at the time of the crucifixtion which "changed the whole face of the land" with mountains rising up out of valleys, mountains sinking down out of site, smooth places becoming rough, cities sinking in the sea, etc. Very little geographical information is given in 4th Nephi, Mormon and Moroni. Another problem I feel is that the prophets always refer to their promised land as being a land of liberty, where the gospel will be restored and their records come forth; so how can the civilization be placed in Central America and confined to a small land area? Central America is not and has not historically been a "land of liberty" nor was it the place where the Book of Mormon came forth and the gospel restored. We tend to look at almost any history through the lens of today using our own experience as assumptions. In the end, does the geography really matter, except to satisfy curiosity? The message of the Book of Mormon is the reality of the Savior and His Atonement. Thanks for your comment. 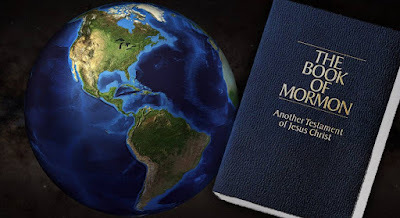 By way of response, I would point out to you that most of the geographic descriptions in the Book of Mormon were written by Mormon/Moroni, hundreds of years after the destruction. Throughout the text, it is apparent that Mormon and Moroni are familiar with the landmarks of earlier records (Rahmah/Cumorah, for example), and destroyed cities are rebuilt in the same place. This is a matter that scholars have already thought of, and (for good reason) do not consider it an obstacle for evaluating BoM geography. As for the "promised land," and "land of liberty", I think we ought not confuse ancient conceptions of a "land" its limits with modern geo-political boundaries and entities (the whole problem of reading through the "lens of today", as you say). I see no reason why the BoM history could not have play out on one part of this landmass, while the prophecies regarding that landmass get played out in a different part. You are right that we tend to to read the book through the "lens of today" and making assumptions based on our experience. As I just pointed out, I think you are a little guilty of this yourself. But this is exactly why BoM geography does matter, beyond merely "curiosity." We can replace our assumptions and lens with that of the their own cultural assumptions only once we have figured out what culture that was--which requires that we find the right place. Those who care enough have learned a great deal about the Bible by studying its historical context in the ancient Near East. There is not reason to think that finding the right place cannot do the same for the BoM. Yes, the message of the Savior and his atonement is what is important, and we can grasp that well-enough without settling the geography question. But, the better we can understand the books geography, the better we can understand the books message, and that is something worthwhile to pursue. You might think "well-enough" is good enough, but the Lord chastized the early Saints in the D&C for not paying enough attention to the Book of Mormon. I tend to think we need to take the book very seriously, in every aspect. While we may not solve every detail, it is as we are working things out in our minds that we open ourselves up to the inspiration and revelation of the Lord.